So, you’ve gotten as far as you can go with your tone, and now you want to add some more. Where do you go from here? 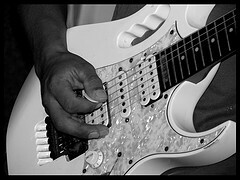 Many beginner guitarists ask themselves that very question and most don’t really know the answer. Today’s post is going to hopefully answer that for you all. Adding effects is the quickest and easiest way to enhance your tone, regardless of what you play. A properly placed effect can do anything from a subtle enhancement to complete spaced-out weirdness. As with anything else, though, you can’t just slap together effects and hope for sound. Well, actually you could, but you’ll still save a lot of time and money if you at least kind of know what you’re doing. There’s a lot to talk about when it comes to effects, but I’m going to avoid getting into specifics in this article. There’s plenty of other resources on the internet if you want to tech out, and I may even add more later. But for now, I just want to give you a basic overview of what’s out there and what can be done to get you started. So what is an effect and what does it do? An effect, as we’re talking about here, is anything that will change your electronic signal and therefore your sound. It’s like a GOBO on a light rig or a camera, it goes between the source (guitar, bass, or microphone) and the output (power amp and speaker) and changes things along the way. 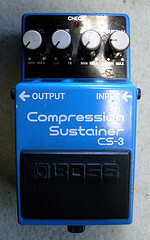 An effect can be in the form of single stompboxes, multieffects, or built in to an amplifier or recording program. They can be digital or analog, solid state or tube. 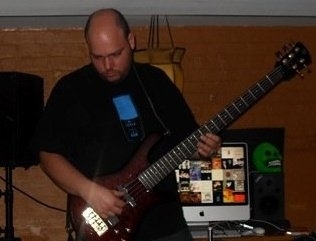 Any instrument can take an effect. Electric instruments, like electric guitar, acoustic guitars with pickups, basses and electric drums, can be plugged right in. Microphones that pick up acoustic instruments, like voice, drums, or horns, can also have effects. With a little know-how, you can create wild new sounds. 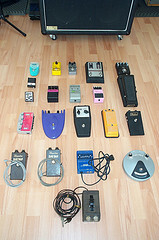 There are hundreds of different effects pedals and processors. Fortunately, most fall into some pretty basic categories. I’ll cover the most common effects and their uses, by no means is this list going to be complete. 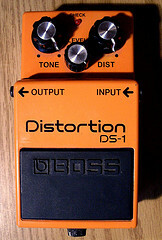 Just about the first thing any guitarist ever owns is some kind of distortion pedal, usually a Boss DS-1. Distortion is also built into most amps, either with a switch or simply by turning it up too loud. Understanding the basic physics of distortion helps you understand how to use it. The basic principle is this: an incoming signal is too loud for an amp or circuit to reproduce, so the waveform gets cut off, or “clipped.” This causes it to sound distorted. If you want a better answer to how all this works, our friend Wikipedia (http://en.wikipedia.org/wiki/Distortion_(music)) will explain all. A little bit of clipping is called overdrive. This sounds natural but “pushed.” Moderate to heavy clipping is called distortion and now sounds completely different from your “clean” (unaffected) sound. Extreme clipping is called fuzz and turns your sound into something unrecognizable. The most important thing to know about distortion of any kind is its relationship to volume. Remember, distortion is created when your incoming volume hits the clipping ceiling. Once you’ve maxed out your signal, increasing your incoming volume increases distortion, not overall output volume! This fact will affect you in several ways. One, distortion is a dynamic effect, the better ones more so than the cheaper ones. This means the effect will respond differently to different incoming volumes. 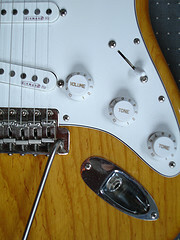 If you roll down the volume on your guitar, the distortion will go away. Bring it back up, it will come back. Plenty of guitarists use this fact to their advantage. A good distortion circuit will even be sensitive enough to respond to changes in how hard you pick. Second, if you choose to use a boost or volume pedal, where you put it will dramatically change its functions. Like the name implies, a boost pedal gives you a straight boost in volume, while most volume pedals give you a cut in volume you can sweep with your foot. Put these in front of a distortion circuit, they will change the amount of distortion. Put them after, they will change the amount of output volume. If you get your distortion from your amp and you want a solo boost, not a distortion boost, you’ll have to put the pedal in the effects loop (more on this later). Some effects aren’t about wacky sounds, they’re just there to enhance your tone. Compression is basically an automatic volume regulator. It takes the loud parts and quiet parts of your tone and compresses them together so they’re closer in volume. This helps quieter notes pop out and keeps your peaks under control. This is very useful for fingerstyle guitarists and essential for slap bass. As your notes decay (get quieter) a compressor will bring the volume back up, which will give you more apparent sustain. 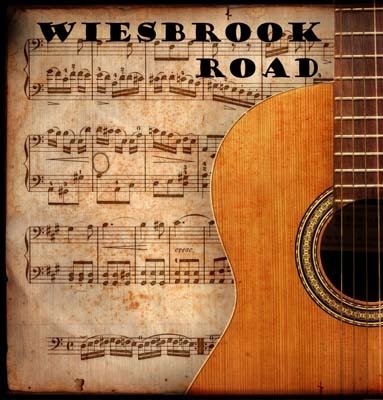 Guitar players love this for solos. Equalization or EQ is just like it is on your home stereo. It’s basically a set of volume controls for select bandwidths. Therefore you can boost bass and cut treble while leaving the mids alone. The more bands you have, the more control you have. EQ in pedal form is useful when you want to switch settings on the fly, otherwise the EQ built into your amp is usually sufficient. The second pedal most guitarists end up with is a wah. Like an EQ, it boosts and a specific band of frequencies and cuts the rest. Unlike an EQ, the specific band that’s getting the boost is sweeps from low to high and back again, creating a sound similar to a trumpet mute. Wahs come in two main varieties: A traditional wah is a pedal you can rock back and forth with your foot to create the effect. An auto-wah is touch-sensitive, i.e. it listens for your attack then automatically creates the wah effect. An auto-wah is nice for when you need your feet free or don’t want to coordinate the timing with your feet. Many of these pedals often have synth settings on them that can make your guitar or bass sound like a retro analog keyboard. A traditional wah is nice for when you want complete control. 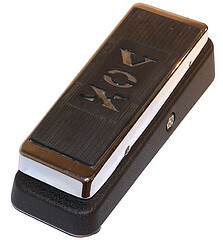 Some guitarists even use a wah as a kind of notch filter, leaving it in one position to create a very narrow, concentrated tone. There’s a wide variety of different modulation type effects, but they all do the same basic thing: grab a parameter of your tone and change it in a repeating pattern. 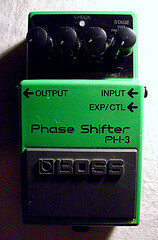 Phaser, Flanger and Chorus are all very similar. All three split your signal in two and create a contrast with the second signal. 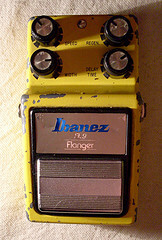 Flanger puts a very slight delay on one side of the signal, creating a jet-airplane sound. Think “Unchained” by Van Halen or “Barracuda” by Heart. The drums in Zepplin’s “Kashmir” also use flange. Phaser takes one part of your signal and puts it out of phase, creating sound similar to that of a rotating speaker cabinet. The bass on Ted Nugent’s “Stranglehold” is a good example of this. It’s more funky and a lot less hair metal sounding than the flanger. Vibrato and Tremolo are terms often used interchangeably, but they are not the same effect. Tremolo modulates volume (moves it up and down) in a repeating wave pattern. Vibrato modulates pitch. Leo Fender decided to confuse the guitar playing world by labeling the tremolo effect on his amps “Vibrato” and the pitch-bending arm on his guitars “Tremolo.” So it can be a little confusing as to what you’re actually getting when you get into this stuff. 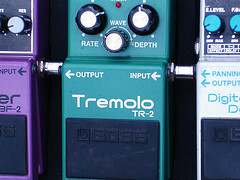 Tremolo can be used to create a nice surf-rock sound, or you can crank the controls and get a slicer effect (think Green Day “Boulevard of Broken Dreams). Vibrato can create a wacky little flutter, but too much will make you sound out of tune, so be careful when using this one. These effects are a little more wacky, so I won’t dwell on them too much. Harmonizers add a note above or below the one you’re playing, allowing you to play essentially two parts of a harmony by yourself. On guitar, you can be both guys from Judas Priest at the same time. On vocals, you can be a one-man barbershop quartet. 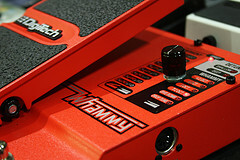 Pitch Benders like the Digitech Whammy work like wahs, except instead of sweeping tone they bend the note up or down. Think every guitar solo by Tom Morello and you’ll get the idea. Time-based effects allow you to play way more than you could on your own, and are some of the most fun. Reverb essentially creates the same kind of echo you would get in various sized rooms, from a small room to a grand concert hall. This can be used subtlety to fill out your sound or cranked to create psychedelic space-notes. Delay is very simple. You play a note, it plays again; like an echo but this time it’s bouncing off the Grand Canyon. Turned down, you can create reverb-like space effects, turned up you can make it sound like you’re playing twice as many things as you actually are. 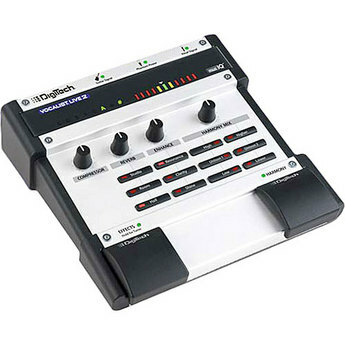 Loop pedals work on the same principal as delays, but instead of repeating every note and letting it trail off, it repeats a selected phrase over and over. This allows you to lay down a harmony section and then play a lead over it. For the one-man acoustic act, this is a must-have. You can, of course, chain more than one effect together. Since each effect changes the sound before passing the signal on to the next, the order in which these effects are arranged can drastically alter the sound. The following is the preferred order of effects. You aren’t going to break anything by not following this order, you just might not get the sound you were after. If you get the sound you want following a different order, go for it. No one is going to argue. Tuner -> Wah (esp. AutoWah)-> Compressor -> Distortions (low gain to high) -> EQ -> Pitch Effects -> Modulations (any order) -> Reverb -> Delay -> Loop. If you have a separate out for your tuner, use that. 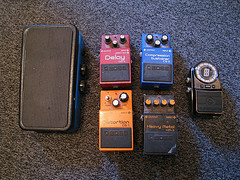 If not, and you use a tuner pedal, put it first (closest to the instrument) so it tunes the guitar and not the effects. Since touch (auto) wahs respond to your picking volume, it should get the cleanest sound possible so it can “hear” what you are doing and respond appropriately. In general, wahs narrow and enhance certain frequency bands, which can get out of hand of there’s a compressor or distortion before it. Compressors boost low volume notes, which also means they enhance noise. Therefore, you want to keep these close to the beginning of your chain so they are fed as little noise as possible. Like compressors, distortion can also enhance noise. Distortion can also create noise, especially when used in combination, which makes placement very important. If you use your amp for distortion, the effects loop can help you with this. I’ll talk more about this in a future post, but basically anything outside an effects loop (plugged into the input) is before the distortion, and anything inside the effects loop (send and return) is after the distortion. EQ can be placed before or after your distortion, depending on where you want to shape your sound. I prefer after, to shape the final product, but you don’t have to listen to me. Pitch effects work best after distortions. I have no scientific reason for this, it just seems to work. You are very unlikely to use more than one modulation at a time, since the competing waveforms will cancel each other out and likely produce nothing but muck. Keep them after distortion and before delay, but it doesn’t matter if phaser precedes chorus or vibrato precedes tremolo. You most likely want your reverb to capture your whole sound, so put it at the end. 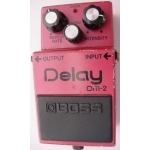 You want your delay to capture your whole sound including your reverb, so put it even further at the end. You want your loop to capture everything up to and including your delay, so put it at the very, very end. There’s lots more to write about the subject of effects, and this will just be the first of many posts to come. Meanwhile, take your new found knowledge of effects and start playing with whatever you might have at hand. There’s no such thing as a fatal mistake, so go nuts! This entry was posted on Thursday, August 5th, 2010 at 6:00 am and is filed under Back To The Basics. You can follow any responses to this entry through the RSS 2.0 feed. Both comments and pings are currently closed.